ACS KUBOTA PRO DECK (AERODYNAMIC CUTTING SYSTEM): The airflow inside the deck has been optimized for faster, more efficient cutting and discharge by preventing clippings from clumping, sticking to the walls of the deck, and recirculating to be cut again. The improved airflow also results in reduced power consumption, work efficiency, and increased fuel efficiency. The deck also features a large, durable spindle shaft for better airflow, clean-cut blades and a flexible discharge chute to ensure a smoother discharge and more uniform discharge of clippings. COMFORT AND CONVENIENCE: 1. Foldable ROPS for easier storage and transportation of the mower. 2. 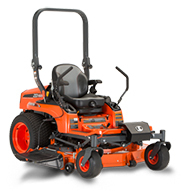 Easy mower and engine access, plus optional maintenance lift. 3. Outstanding stability on a variety of terrains thanks to a lower center of gravity, long wheelbase and low profile tires. 4. Adjustable suspension seat with dual adjustable armrests, higher backrest and lumbar support. 5. Adjustable HST levers not only provide more legroom, but also more settings to choose from. 6. Hands-free parking brake. 7. Thick platform mat to reduce noise and vibration while providing extra comfort. 8. Storage box. 9. Cup holder.